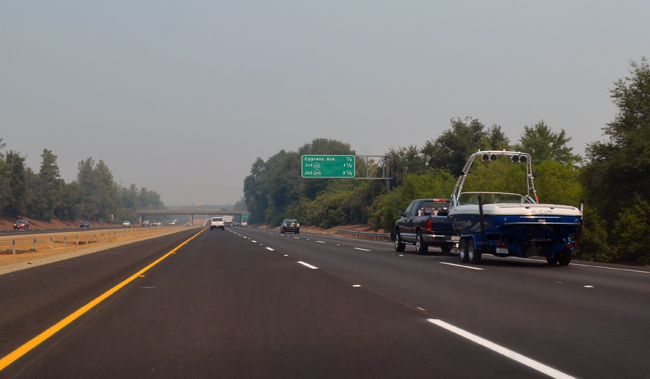 Interstate 5 is six lanes wide now in Redding. With thick smoke from local wildfires standing in for urban smog, we can glimpse a future where our town begins to resemble the rest of California. So best get your furnance and air filters 20×25 ordered, because if this is the way Redding is heading, you’re going to be changing them a lot. Just need to fill up the lanes with bumper to bumper traffic, and the image will be complete. Progress, or so it would appear. This entry was posted in Cars, Opinion and tagged Cars, Opinion. Bookmark the permalink.